We take a look at the world of motorized golf carts, including how to decide if you should buy one, what to consider when doing so, and some of the leading brands on the market. If you have played the sport of golf extensively, chances are you have once or twice enjoyed the fantasy of having your own golf cart to zip around the course in. There is no shame in the dream, we have all had it, but most people ultimately decide that it just isn’t feasible. But is it? Actually, it might be a little bit more practical than you probably think. Owning a motorized golf cart certainly isn’t for everyone, but for those that are a good fit, it offers an opportunity for good times, super cool trick or treating ventures with the kiddos (perhaps not the recommended use) and possibly even the potential to save some money. We will get into all of that now, as we dive into the world of motorized golf carts. Is buying a motorized golf cart for me? That’s definitely the right question to be asking yourself right now. Motorized golf carts are certainly not an appropriate fit for everybody. Let’s take a look at a few deciding factors to determine whether or not buying a motorized golf cart is a good idea for you. The more you play, the better. For instance, if you play once or twice a year, there is no reason at all to even think about buying a motorized golf cart. However, if you are one of those lucky people that get to play a few times a week, not only is it an ok idea, it may actually save you some money in the long run. One of the beautiful things about owning your own golf cart is that you no longer have to pay cart fees when you go to the course. Depending on where you play, that could save you anywhere from $20-50. Golf carts don’t come cheap of course, so you will have to play many times over a few years to really make your money back, but if you are able to do that you can turn a splurge purchase into a really awesome idea. Do you ride every time? Sometimes it is nice to walk the course instead of ride. While many people opt for the cart every time, there is also a steady population of golfers that prefer the pace and exercise of a walked round. Unless you ride every or almost every time, you aren’t going to get the most out of your cart. While your golf cart certainly isn’t going to be the size of your car it’s not exactly small either. Before you get too excited about your new dream purchase, make sure you actually have the room to store your golf cart. If there is a golf course that you frequent, they may allow you to store it there, though you should probably expect a storage fee of some sort. It depends on the course, and how much you play there. Of course, it then becomes a hassle taking your cart out to play at other places, but that might just be a concession you have to make. If you aren’t able to store your golf cart at the course, you will need to make sure that you are able to haul it. For that, you will need a trailer, and a car capable of hauling said trailer around. If you don’t already have those things on hand, buying a golf cart may not be the best idea for you. Even among those of us who play often, there is a wide range of budgets when it comes to golf. If you opt for the thrifty clubs and bargain courses, buying a golf cart probably isn’t going to be right for you. To get a good, reliable model, there is really no way around spending a healthy chunk of money. You’re also going to see the biggest return on your investment from the more expensive courses that charge a big premium on their cart fees. If the difference between riding and walking at your course is only a matter of four or five dollars, it will be a very long time before you make your money back. As you can see, there are a lot of reasons not to buy a golf cart. From a practical stand point, they really only make sense for the avid golfer. That said, I’m not here to parent you. If it will make you happy, and you have the money, do it. I’ll even give you some tips to make the most of it as we now take a look at some buying considerations. If it seemed like there were a lot of things to consider before even deciding whether or not picking up a golf cart is right for you, you probably won’t be surprised to find out that there is just as much to think about as you actually begin the shopping process. Let’s take a look. 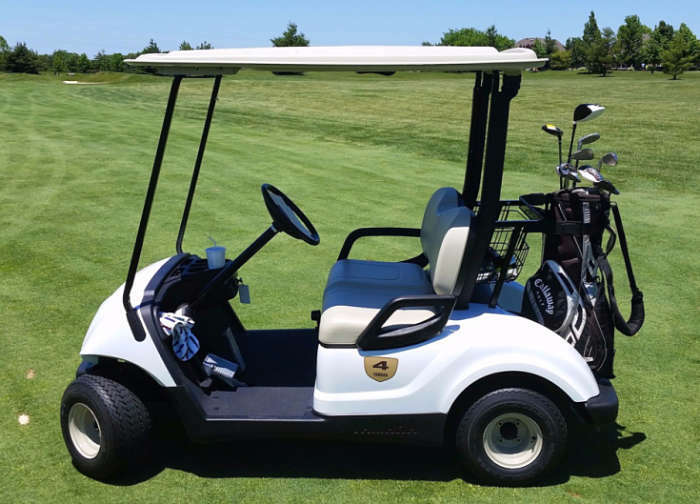 One of the first things you will probably notice as you start looking is that there are options available out there both for gas and electric golf carts. Which one is best for you depends on what you are looking for. The gas powered cart is fueled by the same gasoline that powers your automobile. Because of that, it is going to go a little bit faster than the electric car. You also won’t have to worry about replenishing the power source nearly as much, and when you do refuel it will be as quick and simple as putting gas in the tank. It is worth noting that gas powered carts are more expensive than their electric counter-part, and perhaps for that reason, a little be less common in the world of personalized golf cats. Electric golf carts are more common than gas-powered carts now because they’re both more cost effective and more environmentally friendly. The electric golf cart is what you will find at most courses now. Rather than gasoline, it operates off a battery that you will have to charge after each use. When the cart is on a low charge it will go slower, and then ultimately stop moving altogether, which can put you in something of a pickle considering it takes hours to charge the cart battery. Still, it is cheaper to operate, and it is also a lot better for the environment. I’ve even heard stories from friends that own electric golf carts that were able to get tax deductions because it technically qualifies as an electric car. While the gas-powered cart used to be the most prominent option on the market, electric models have since dwarfed it. That doesn’t mean you have to choose an electric cart, of course. It really depends on what you are looking for. If you are interested in speed and power, the gas cart is probably going to be your best bet. If you want something a little friendlier to the wallet, and the planet, choose electric. Let’s take a look at what to look for as you begin to make your buying decisions. Buying a used golf cart is a good way to save a lot of money, but of course buying new has its own set of benefits. With a new cart, you can be sure of the quality, and be fairly confident that your cart has a long life ahead of it. When you buy used it’s a little bit harder to know for sure what sort of condition the cart you are getting is in. The same way you don’t know for sure how well a used car has been cared for, the same can be said of a used cart. Buying from a reputable dealer will go a long way towards ensuring that you aren’t picking up a lemon. There are a lot of features to consider when buying a golf cart. More features make the ride a little bit more comfortable and convenient, they also ramp up the cost. Features can range from extra cup holders and places to keep food, to built in GPS systems and plush interior designs. The price can range pretty wildly when it comes to golf carts. Of course, new or used, gas or electric, fully loaded or relatively basic are all components that will determine how much you pay. Either way, you can expect your golf cart to cost anywhere from $1,000 – $10,000. It can cost even more than that when you get one custom built. You should look for a reputable brand when you buy a golf cart (we will highlight a few a little bit later). While for many products you can get away with choosing the off brand, there are a few reasons you shouldn’t take that route when it comes to your cart. For one thing, buying name brand does give you a degree of quality assurance. You can count on getting something that has built a reputation of being of high-quality. The other (and perhaps more important thing) is that it is easy to get replacement parts from established brands. If you need to replace your tires, or battery, or any other part, you can rest comfortably in the fact that, while it may be expensive, it will at least be easy. If you are buying a used cart you will want to make sure that you are getting a good set of tires. Pay attention to the traction. Just like when you buy a car you don’t want the tires to be too smooth or worn out. That said if you find a used cart with worn tires, but everything else about it is perfect, you can still feel free to consider it a buying option. Tires are relatively cheap to replace so don’t let those make or break a deal. In the case of the new cart, you can still pay attention to the tires. There are different options out there depending on what kind of terrain you plan on using it for. Now that we have identified some of the primary things to look for as you begin the process of shopping for a golf cart, I will highlight a few of the major brands out there, so you will know where to start your search. EZ-GO is a brand that has existed for over sixty years and actually makes a wide range of utility vehicles. If you decide that you would like to go the route of making a custom cart, they are also well regarded in that department as well. Yamaha established itself as a brand by making motorcycles as well as water vehicles. They have since taken their extensive knowledge of producing quality vehicles and used it to become the only golf cart manufacturer in the world to build their own engine. You might not care about that, but you should care about the power and fuel efficiency of this cart. They also have battery powered models. Club Car is one of the oldest, and most well-known brands in the golf cart market. You’ve definitely used their stuff before. While not as customizable as EZ GO, you can still count on getting a good cart that will last for a long time. Chances are you will end up with a cart that looks a lot like the ones that you find at your local club. That’s not exactly as exciting as getting a custom cart, but it is economical and reliable. There is a lot to consider when it comes to motorized golf carts, but what’s really important is that you weigh all your options, study them closely, and select a cart that fulfills your needs and makes you happy. The process may be a little bit stressful, but trust me when I say that the time spent weighing your options will be well worth it. Once you get your cart, you count on luxurious rides around your favorite course that will make you the envy of all your friends.